This page provides a brief history of the Loyal Edmonton Regiment. If a more detailed history is required please go to The Loyal Edmonton Regiment Military Museum website and look at the Regimental History section. The Loyal Edmonton Regiment traces its beginnings to the 101st Regiment which was authorized in Edmonton effective 1 April 1908. In 1909 it was renamed the 101st Regiment (Edmonton Fusiliers). This was Alberta’s first infantry unit. When the First World War broke out, the 101st Regiment (Edmonton Fusiliers) recruited a contingent to wartime establishment of over 1200 officers and men within weeks of war’s declaration and had moved to Camp Valcartier to the west of Quebec by the end of August 1914. By that time the decision had been made to create the Canadian Expeditionary Force which was to include new numbered infantry battalions which would exist only for the duration of the war. As a result, all members of the 101st were transferred into the newly created 9th Canadian Overseas Infantry Battalion, CEF. The 9th Battalion went overseas in October of 1914 but never made it to France. Instead, it became part of the Canadian Training Depot and Reserve Battalion system which supplied reinforcements to the battalions fighting in France. The 101st itself continued to exist as a militia unit in Edmonton and contributed many more officers and men to the Canadian Expeditionary Force. The 49th Battalion, CEF, was raised in Edmonton in January of 1915 by Lieutenant Colonel William Griesbach and landed in France early in October 1915. They fought in France and Flanders for the next three years with two soldiers winning the Victoria Cross, one at the Somme in 1916 and the other at Passchendaele in 1917. Early in 1916 the unit added its city of origin to its name and became the 49th Battalion (Edmonton Regiment). The battalion returned home on 22 March 1919 and was quickly reduced to zero strength. In a reorganization of the Non-Permanent Active Militia in March 1920, the 101st Regiment (Edmonton Fusiliers) became simply The Edmonton Regiment with two active and three reserve battalions. Each of these battalions was designated to perpetuate one of the CEF battalions that were raised in Edmonton. The 1st Battalion perpetuated the 49th Battalion and was made up of many of the officers and men who served in the 49th. The 2nd Battalion, which perpetuated the 9th Battalion, consisted mostly of members of the Edmonton Fusiliers. The three reserve battalions perpetuated the 51st, 63rd and 66th battalions respectively. As part of this perpetuation, the 1st Battalion, The Edmonton Regiment, inherited the battle honours, history and traditions of the 49th Battalion, CEF. In 1924, the Edmonton Regiment was split into two separate regiments of three battalions each – one active and two reserve. The first regiment, still called The Edmonton Regiment, consisted of the original 1st, 3rd and 4th battalions. The second regiment, now called The Edmonton Fusiliers, consisted of the original 2nd and 5th battalions plus a new reserve battalion. 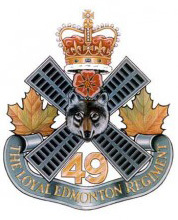 The 1st Battalion of the Edmonton Regiment continued to perpetuate the 49th Battalion which was reflected in their shoulder titles which read 49th Edmonton Regiment. At the outbreak of Second World War, The Edmonton Regiment was chosen as an Active Service battalion. It trained in England from 1940 to 1943 and was part of the defense force. In July of 1943 the unit was renamed The Loyal Edmonton Regiment. This occurred just as the unit was about see action against the enemy. From 1943-44 the “Loyal Eddies” participated in the invasion of Sicily and the Italian campaign, highlighted by the difficult Battle of Ortona, which to this day is considered a model for the techniques the unit developed for fighting in built up areas. In 1945, the Eddies were transferred to and fought in Northwest Europe until the end of the war. After the war, the active service battalion stood down and the 2nd Battalion (Reserve Army), formed in 1940, carried the regimental name into the post-war Militia. In 1954 the regiment was affiliated with Princess Patricia’s Canadian Light Infantry and was re-named The Loyal Edmonton Regiment (3 PPCLI). When a regular force 3rd Battalion was raised for the Patricia’s in 1970 the Loyal Eddies were renumbered as the 4th Battalion. The Regiment earned an exemplary battle record during the course of the First and Second World Wars. Since 1945, members have deployed on various UN and NATO missions including Korea, Cyprus, Croatia, Bosnia and Sudan. In 1951 two companies were raised and served in NATO. E Company served in West Germany as part of the 1st Canadian Infantry Battalion while F Company was stationed in Valcartier with the 2nd Canadian Infantry Battalion. Most recently, members of the unit were a part of the Canadian Forces fighting in Afghanistan, during which time three members were killed on duty. The Regiment was subsequently awarded the battle honour “Afghanistan”.